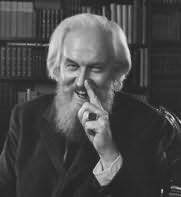 William Robertson Davies, CC, FRSC, FRSL, was a Canadian novelist, playwright, critic, journalist, and professor. He was one of Canada's best-known and most popular authors, and one of its most distinguished "men of letters", a term Davies is sometimes said to have detested. Davies was the founding Master of Massey College, a graduate college at the University of Toronto. "An admirable book, I enjoyed it greatly."